Thingamajig showcases the many processes of printmaking and ceramics offered at Cal Lutheran. These include monoprints, intaglio, dry point, solar plate, reduction, lino and woodcut relief prints, on the one hand, and a variety of sculptural hand-built and wheel-thrown ceramic techniques, on the other. The exhibition originated with the students in an advanced printmaking class three years ago. After ceramics students were invited to participate, the show developed into a biannual printmaking/ceramic experience. Student curators for Thingamajig V include Mardell Lopez, Hallie Maxwell and Quinn Rosenblatt. 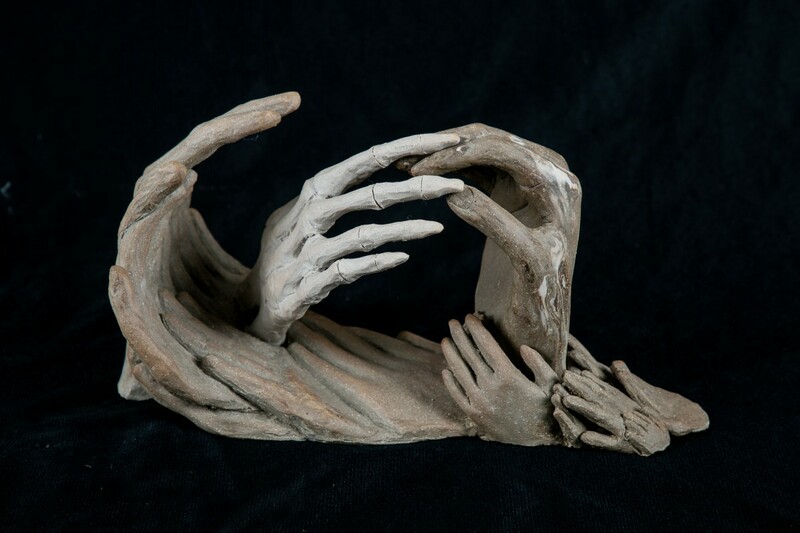 Hallie Maxwell, The Hands of Time, ceramic sculpture, 2018. Courtesy of the artist.